Nice looking van. Low miles. I'd want to know the weight and the GVWR. No A/C? Is that A/C above the microwave? It's been for sale a long time. Low miles and LBZ Duramax are good things but depends on what you want. The floorplan looks cramped, like too much stuff was crammed in there for the size of the interior. 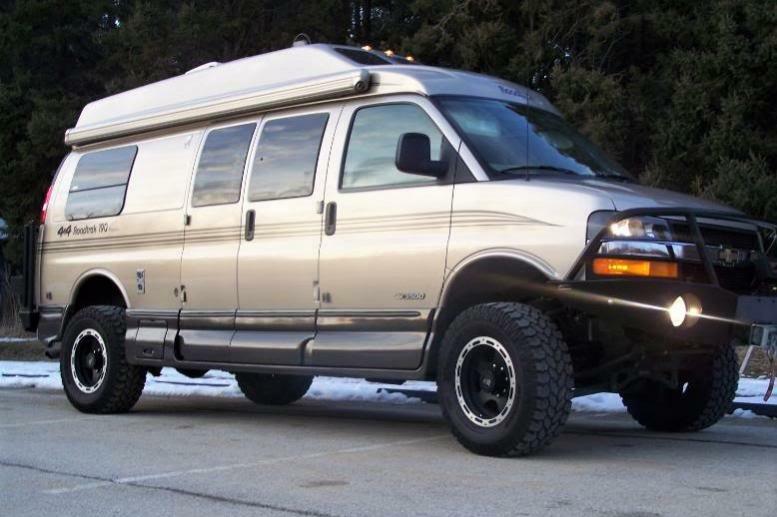 Initially i was looking at Roadtreks - similar to the Van in the link, but for me it was too geared for pavement (not enough clearance, and my confidence was low in regards to how securely the interior had been mounted - in other words, would it develope a lot of rattles after a short period of use). From a distance, looks well taken care of. Will have something fully self contained, and you can (over time) add what's missing. It all depends what level of adventure interests you - came across a Roadtrek (see pic below) that was some inspiration. The absence of 4x4 doesnt take you out of the game (many live without it): lift this Chevy 4", throw on some cool wheels & 33's, add some front & rear bumpers - and pretty much be able to access a lot of the backroads. Thanks that's what I'm going for. Already have an appt with advanced 4x4 in salt lake city. How does your username work after you've been helped? That thing has been for sale forever. Which to me says the owner is not negotiable on the price. Might be worth it, but seems like a lot of money for a high top 2wd to me. Those are the least desirable in my opinion because they sleep the fewest. If the price is palatable to you, go for it. Seems very clean and the diesel will be great. Maybe “Help me spend more money on my new van”? This forum excels at that.